Gorgeous Layered Tags and an Announcement! 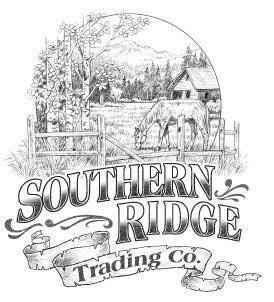 Dianne is such a talented mixed media artist! I love how she puts together her projects, and these tags were a lot of fun. We layered on sprays and stains and inks and had lots of fun with all sorts of techniques. This fun flower was covered with a thin metal tape, diecut, and then embossed with an embossing folder. We added some Ranger Alcohol Ink to give it some pretty colour and added a brad in the center. This is one of those techniques that makes me say "I really need to use this metal tape more"! I love this globe diecut and the Tim Holtz rub on words on this tag! The pretty diecut fall leaves and beautiful layers makes this one my favourite! The heart covered in fabric with a sweet metal charm is lovely! I love the purples and oranges in this tag. The purple flower is a diecut flower, crumpled up and sprayed with some spray ink! The ribbons on each tag were plain seam binding ribbon, each sprayed with a different colour of ink to coordinate with the tags. It was neat to see how different each person's tags were even though we were all using the same supplies! 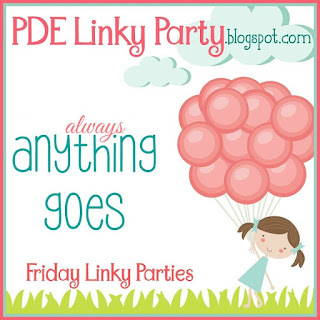 I'm also really excited to announce that I'm officially part of the Design Team over at the PDE Linky Party blog!! Be sure to check out their Anything Goes challenges and awesome Design Team! Thanks for stopping by today and letting me share a little crafty fun with you! Hi all my friends! I thought I'd share a quick photo tour showing you my Halloween decorations. The girls were so excited to decorate for Halloween, but we definitely don't get too spooky! Here's our mantel. I printed off a Halloween Subway Art printable last year on photo paper and placed it in a frame. Underneath I created a banner using my Cricut and stamped images. We hung a spooky chandelier and added a few more accessories. You can see the details on the banner in my post here last Halloween! Looking in from the kitchen, you can see this fun sign from the dollar store. I love this canvas I made last year with my Cricut! You can see all the details on this project here. I placed it above a shelf, around the corner from my kitchen. Last year at the Scrapendipity Make 'n Take we made Halloween tags with Holly and then framed them in this wooden frame that I painted black and stamped with a scroll stamp using gold ink. I placed the tag sign in my entryway along with some pumpkin and fall flower decorations. You can even see the outline of our purple skeleton behind the curtains! I have an Ikea shelf in my living room (with lots of toy bins in it!) that I decorated on top with a wooden shadow box with lots of vintage Halloween papers and stamps. I added the wooden witch sign and a yummy pumpkin candle from Bath and Body Works along with some other Halloween decor. You can find the details and close ups of the shadow box here. On the hutch in my kitchen I added a few fall trinkets on top and a lantern and ghost candle holder to the shelf that holds my recipe books. I seem to use so many online recipes now that I've only kept my fav cookbooks! Thanks so much for joining me! I hope this gives you some inspiration to use some papercrafting items in your own decorating. Even framing a cute Halloween card gives your space a personal touch! FCCB #263 - Fright Night! Make a project featuring Halloween! For my project this week I decided to make a Halloween tag! I first cut a tag with watercolour paper in Cricut Design Space from the Art Philosophy cartridge. I attached the spider webs from the Paging Supermom cartridge and changed them from cut to write so the web printed directly on the tag. I layered orange, purple and green Distress Stains on my tag and blended with water to colour it. The raven, cat, feathers and flowers are all cut from the Creative Bug cartridge. These were all free cuts in Design Space! I cut the flowers out of different papers and simply bent them before layering them together with a brad. At the bottom of the tag I used a Tim Holtz mask that I've had forever and used Black Soot Distress Ink to blend around it, creating a little fence. On the top right and bottom left I used a Dylusions circle stencil and clear mat gel paste to create a cool effect over the top layer of my tag. I cut the banner from the Heritage cartridge - I love the thin black layer it cut to go around the green banner! and I stamped it with a sentiment from the Pretty Cute Stamps set Bewitched. Since it's a clear stamp I was easily able to bend it into a shape to fit the banner! Thanks so much for joining me today! I hope you're Halloween week is looking fun, but not too spooky! Thankful Lunch Box Notes and Pilgrim Hat Treat Holder! I'm posting today on the Pretty Cute Stamps blog and wanted to share these lunch box notes I recently made for my daughter, Amie, who is 8. She LOVES having a lunchbox note in her lunch everday she goes to school. Now, I don't always make spectacular lunchbox notes, lol! Sometimes it's just a 3x3 piece of cardstock with a couple pieces of paper or a sticker or flowers on it with a sentiment stamped on the back - but I always put one in and that's just our special thing! I started off by cutting watercolour paper into 3x3 squares. Then, I put some Distress Stains on my craft sheet, spritzed with water, and put my paper into it, moving it around a bit until I got the desired effect. After drying, I added some bits of fall paper I had in my stash. 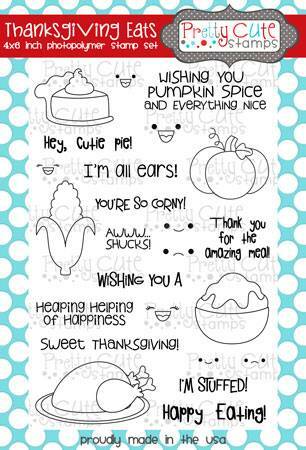 I used the Thanksgiving Eats adorable stamp set from Pretty Cute Stamps, stamped on watercolour paper to add my yummy Thanksgiving images. I used Distress and Tombow Markers to watercolour my images in and added Stickles for lots of glittery fun! Here's the back of the cards - I love all these awesome sentiments included in the set! I used the Sew Amazing stamp set to add running and zigzag stitches to my cards, and then added a bit of Glossy Accents to my hearts. Here's a look at this sweet set! I also wanted to share this sweet little Pilgrim Hat Treat Holder, which is a cut file from Pretty Paper Pretty Ribbons. I made 8 of these for our Thanksgiving Dinner a couple of weeks ago, and they were super easy to cut out with my Cricut Explore! I stamped the sentiment from the Thanksgiving Eats stamp set and heat embossed with white embossing powder before gluing my hats together. Everyone thought they were awesome! Thanks so much for joining me today! 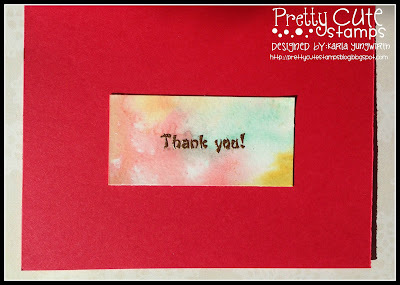 Don't forget our Thank You Challenge is going on right now - you can enter your own project with a Pretty Cute Stamps stamp for a chance to win a gift certificate!! I wanted to share a quick look at my Project Life Week 19! I used a combination of journaling cards and collaged photos from the PL app along with using the Rhonna Designs App to add some digital text before sending my pics to be printed. Then I added in some PL cards and added some handwritten journaling as well. I added some stamps and stickers and diecut ephemera after I placed my photos and cards where I wanted them. 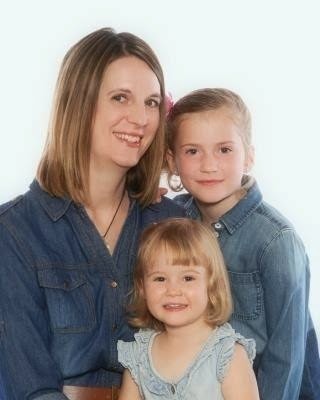 Since it was Mother's Day this week I had lots of extra photos! 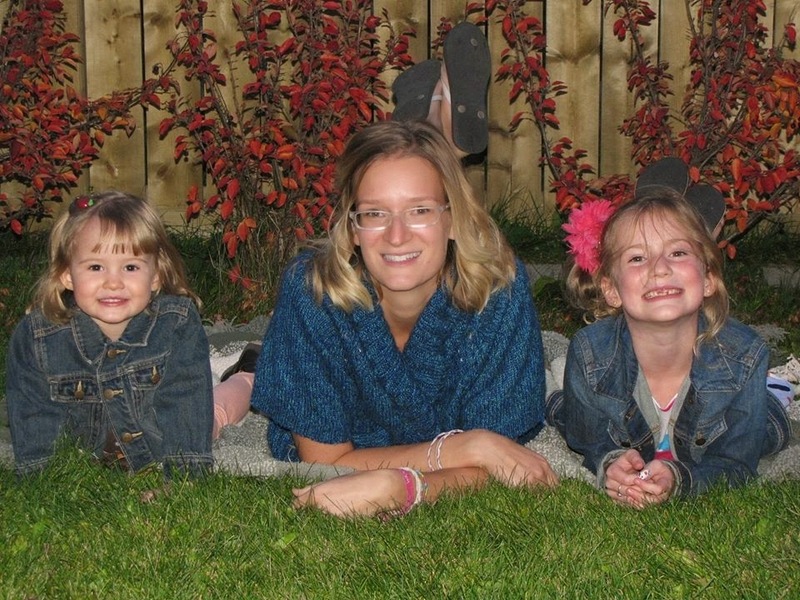 It's so nice to look back at this week and remember again how awesome my kids and husband are, and how blessed I am! Hello friends! I'm back today with a post for the Scrapendipity Way Of Life blog! Recently, I participated in a card swap and the challenge was to create a Fall card using a different fold than a regular 4.25 x 5.5" card. I found an Amazing Card on Pinterest and thought this would be the perfect one to create and decorate for my friends. I started off with two 8x8 sheets of cardstock, since I was making 2 cards. I folded the cardstock in half one way and then the other to create four 4x4 squares. Then, on two of the squares I scored to create 4 triangles (see card below). Here's a look at the yellow card. Erica was being my helper ;) I cut smaller squares of fall paper from the BoBunny Enchanted Harvest collection and cut them in half to create four triangles, which I added to the inside of my card. Two green squares were attached to the unscored 4x4 squares, and I added some stamping and paper. 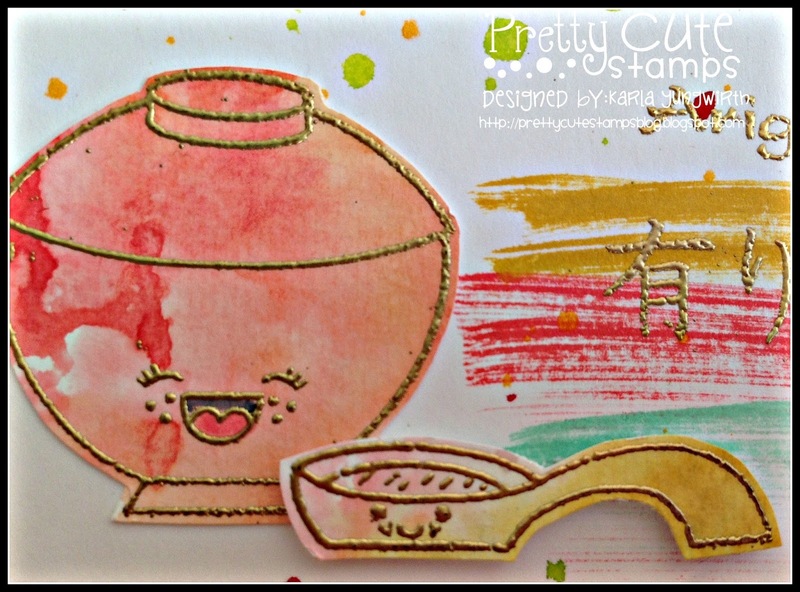 I heat embossed a pumpkin stamp and used Distress Inks to sponge on colour before layering it on my card. For the cover, I coloured my seam binding ribbon with Distress Stains by rubbing them onto my ribbon and then spritzing with water to blend. I crinkled the ribbon and dried it lightly with a heat gun. I used A Tim Holtz stencil to create a background with Distress Inks in coordinating colors and layered it on top of my ribbon - I just love this stencil! It reminds me of a nice, cozy sweater! To finish it off I stamped a Tim Holtz Blueprint Leaf with brown ink on vellum and heat embossed with a crystal embossing powder. Then, on the back of the vellum I used Prismacolor Markers to colour in my leaf image. 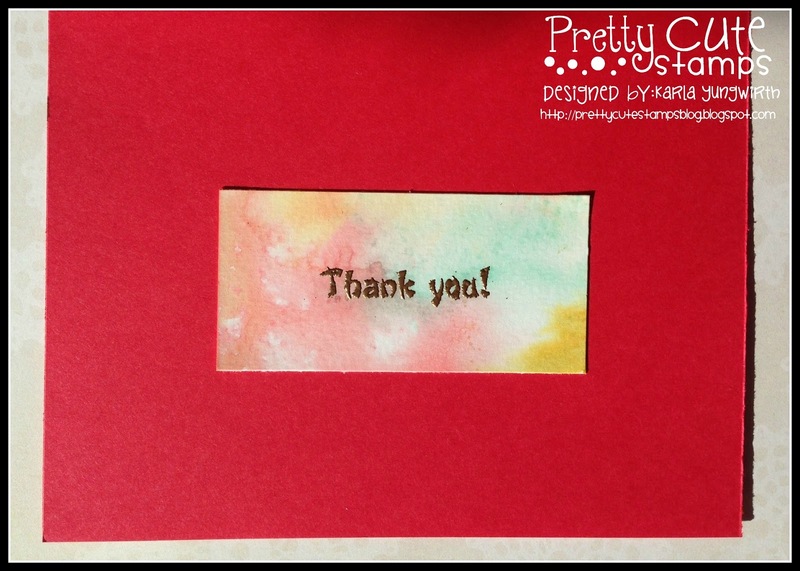 I love how the stenciled background still shows through! Here's a look at how the card folds into itself - leaving you with a pretty 4x4 card! Thanks so much for stopping by today. Here's a tutorial to create this card on YouTube if you want to try it yourself! This is a great card to use up pretty papers you have in your stash and would be perfect for any holiday! 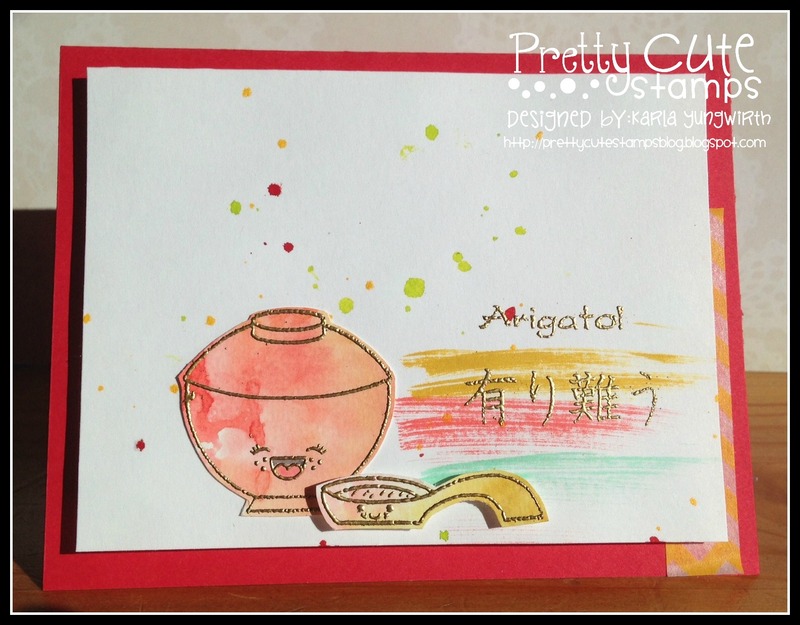 Pretty Cute Stamps October Challenge - Thank You! 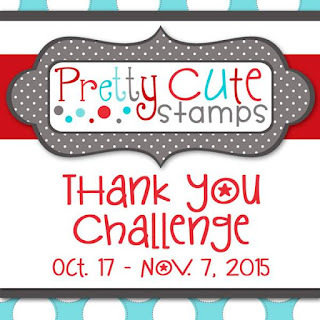 It's time for the Pretty Cute Stamps October challenge, and this month the theme is Thank You!! Here in Canada we just had Thanksgiving on Monday and the US Thanksgiving is coming up for November - so what a great time to think of those loved ones and friends we want to thank. I know I usually get so busy that I mean to send out a thank you card to someone who has made my day special, and then I forget about it. This time I'm going to send my card to someone to let them know how much I appreciate them! I used the Got Sushi? 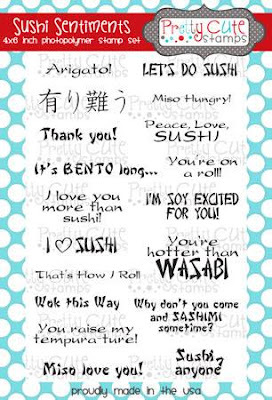 and Sushi Sentiments stamp sets to create this cute Thank You card! I was inspired by a card that Julie Ebersole made for the Hello Monday series and started by swiping some Distress Inks in Fossilized Amber, Abandoned Coral and Cracked Pistachio across a white cardstock background. I used some Dylusions Spray Mists to splat ink on the background after I heat embossed my sentiments (which both mean Thank You!) in gold. I used the same ink pads to do a smooshing technique on my Ranger craft mat, which I spritzed with water and pressed a piece of watercolour paper into to create a background for my stamped sushi images. Then, I heat embossed with gold embossing powder before cutting out the bowl and spoon. I used some foam dots to pop up the spoon to give it some dimension. Inside, I used some of that leftover watercoloured background paper to stamp Thank You on in gold embossing. Love that font!! Thanks so much for joining me today! 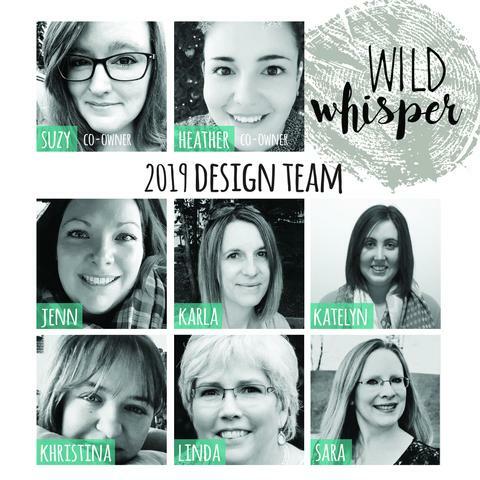 You check out what all the other Design Team members have come up with for this fun Thank You challenge over at the Pretty Cute Stamps blog, and you can enter your own for a chance to win a PCS gift certificate! 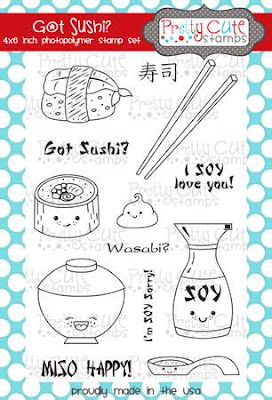 Don't forget to use a Pretty Cute Stamps on your project! I'm posting the In The Word Wednesday segment at the Scrapping Everyday Miracles blog today, and since it was Thanksgiving this past Monday here in Canada, being thankful is definitely on my mind. As a rule, I try to look on the bright side and focus on the positive because I think it's too easy to get caught up in the bad stuff that happens in our lives. I also think that no matter what I'm going through, there's someone else who is worse off, and I really do need to be thankful for the amazing things I have. This bible verse on being thankful is from the NIV, and I used the Rhonna Designs App to create a pretty photo featuring it. I find scrapbooking and Project Life also help me to be thankful and keep track of those gifts that I sometimes take for granted. Here's a layout I created with my photos from Thanksgiving dinner on Sunday in the Project Life App. 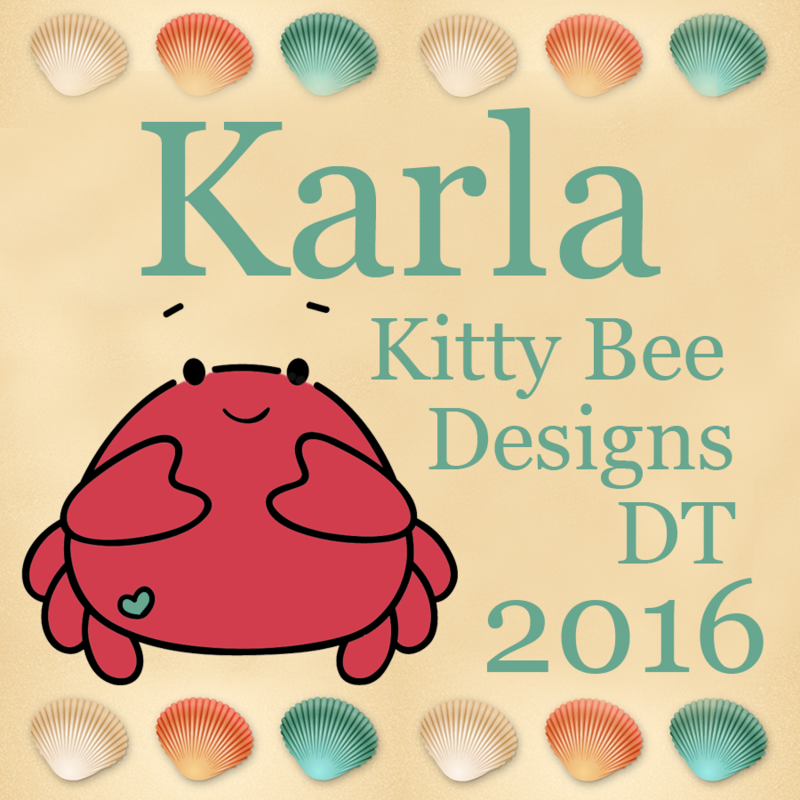 I then used the Rhonna Designs App to add some text and digi stamps. Thank you so much for joining me today! I hope you're inspired to write down something you have to be thankful for, whether it's in a journal, a scrapbook page or just sending a thank you card to a friend to let them know how much they mean to you! Do What You Love Prima Doll Tag! 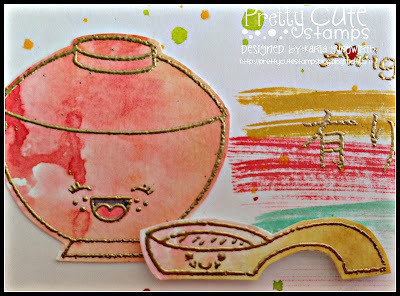 Pretty Cute Stamps October New Release Blog Hop! Watercolour Technique with Wink Of Stella! 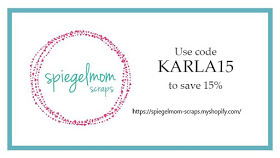 Scrapping Everyday Miracles - October Challenge!